"Probably assume everything is a gun metaphor." Commercial Drive—(November 19, 2017) Korean-American filmmaker Joseph Kahn, most famous for directing visually inventive music videos from pop artists like Taylor Swift and Britney Spears, seems to very much understand and is ably qualified to break down the ills and artistry of contemporary culture and sociology. Produced by Eminem, Bodied is a dynamic indie movie using the competitive rap battle subculture as a means to dissect controversial subject matter relating to racial tensions, cultural appropriation, rampant misogyny, casual homophobia, political correctness, freedom of speech, and white privilege. Written by accomplished Toronto battle rap champion Alex Larsen (aka Kid Twist), the film uses mainstream white culture as an appropriate/ion entry point into the lives of people of colour and their expressions of art. Rap battling often focuses grossly on stereotypical and offensive rhymes as a means of artistry. Kahn and Larsen thoughtfully explore this problematic expression both understanding and skewering its flaws and poeticism. Victoria, BC born American Vandal and former Disney Channel actor Calum Worthy is a perfect vessel of whiteness into the urban world of underground rap battles. He plays a milk toast English Lit grad student, Adam, with the usual trappings of upper class, white liberal America who becomes enamored with the culture of rap battling. HelLA creator Rory Uphold proves formidable as Adam's stereotypical overbearing, liberal elitist girlfriend who is both somehow self-aware and oblivious of her own image and privilege while offering a much-needed takedown and antithesis to Adam's ultimately destructive actions. She is able to be a useful archetype stock character commenting on herself and also gain her own agency by acknowledging her role (or lack thereof) in the unfolding chaos around her. There's a conflicting yet complex portrait of a middle-class African-American father, portrayed by Jackie Long as Adam's rap mentor, with decidedly common struggles trying to balance both his passion for outsider art and familial responsibilities. This performance next to the thoughtful dissection of the plight of Asian male and black female identity politics through dialogue are particularly heartfelt but still offensively vicious and a welcome turn likely inspired by Kahn's own experiences working in Hollywood. 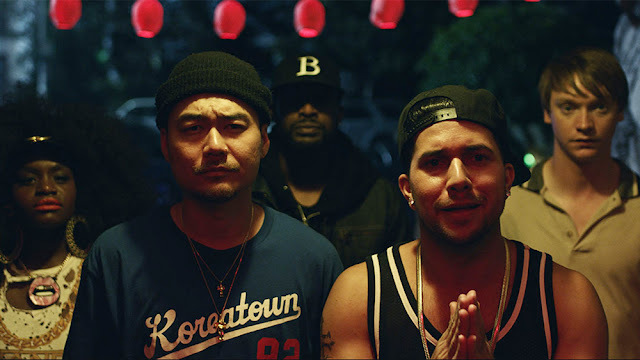 It's no accident Bodied uses rap music spoken by a diverse cast and mix of real battle contestants from Koreatown rapper Dumbfoundead, musician Dizaster, and host Charlamagne tha God to trained actors performing like Walter Perez and Shoniqua Shandai. The mix and balance as wondrously directed by Kahn's keenly trademark visual flair reminds us how homogeneous the culture we consume mostly is. The last arc of the film is a gonzo, all-out, totally masterful series of rap battles that is one of the tensest acts of escalation seen on any screen. Kahn's visuals and Larsen's words build and build to shatter any sense of expectations or how what we say and think affects the lives of others. It breaks and reconstructs accepted notions of identity and culture in its characters so expressively. Bodied is such a self-aware and referential delight in how it intellectually and artfully dissects complex issues in greater mainstream and popular culture. It never shies from incredibly dicey, problematic topics and sees all sides while recognizing both the depth and superficial or silly nature of the art form it uses to visualize these arguments. The film is refreshingly original and an almost completely successful work of melding art and identity politics. It's also a completely nuts and uncompromising vision on the limits of free speech as one of the best communal viewing experiences you're likely to see. 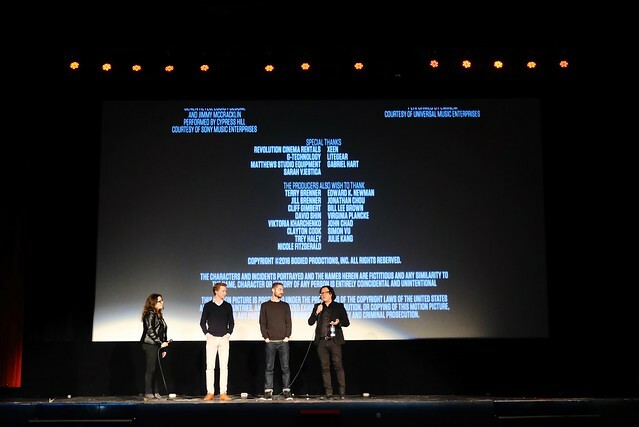 Bodied screened as the closing film of the inaugural Rio Grind Film Festival with Kahn, Larsen, and Worthy all in attendance at the Rio Theatre. The film also won three separate audience awards (unheard of) from TIFF Midnight Madness, Fantastic Fest, and AFI Fest. The film will be released in theatres on November 2nd, 2018 and be available on YouTube Premium on November 28th.